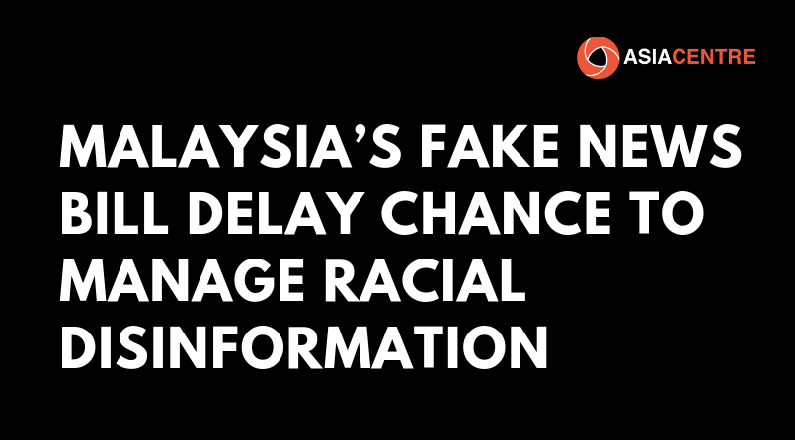 The politics of delay around the repeal of Malaysia Fake News Bill offers an opportunity to manage racial disinformation that can lead to social tensions. This is important as post-elections posturing in the country has brought ethnic politicking to the fore. While it has been argued that the promotion of falsehoods and hatred between communities can be dealt through existing laws such as MCMC Act 1998 – where publishers are mostly held accountable – content created and disseminated by individual producers over social media and extra-territorially beg consideration in any legal or other type of intervention. According to We Are Social, Global Digital Report 2018, from a population of 31,830,000 in Malaysia, 79% of Malaysians (25,080,000) have access to the internet and 76% of Malaysians (24,080,000) access it via mobile devices. Malaysia’s Statistics Department noted in March 2018 that smartphone usage for access to the internet increased to 97.7 per cent, from 97.5 per cent in 2015. In total, Malaysians spend an average of 8 hours 27 minutes per day online. In terms of social media, 75% of Malaysians (24,000,000) access it mostly via mobile devices and spend an average of 3 hours per day on it. The breakdown of Malaysians using different social media platform are as follows: Facebook 16,800,000, Facebook Messenger 11,280,000, WhatsApp 16,320,000, Twitter 7,200,000, YouTube 16,560,000, WeChat 9,600,000 and Instagram 11,760,000. In countries such as Malaysia, which tops the world rankings for WhatsApp usage according to the Digital News Report 2017, there is an increasing preference to circulate information and messages via this platform. Users enjoy a feeling of privacy and secrecy until the message circulating via WhatsApp spills onto publicly exposed platforms such as Facebook or Twitter. When the Fake News Bill was first introduced by the BN government, the disagreement to it was anchored around concerns that the new law will be used to curb the freedom of expression of political criticism, in particular of 1MDB. The definition of what is “fake news” and the Malaysian government’s position to define the “truth” unilaterally via the “fake news” law and applying it extra-territorially with sanctions of up to 6 years in jail and a maximum fine of USD 123,000 caused an alarm. Current attention is on the politics of delay surrounding the repeal of Malaysia’s Fake News Bill. Passed under the Barisan Nasional (BN) government on 2nd April 2018, the Bill was repealed by the Dewan Rakyat (House of Representatives) on August 2018 by the Pakatan Harapan (PH) government following its victory in the 9th May 2018 general election. However, the rejection of the repeal by the Dewan Negara (Senate) on 12 September 2018 could result in a delay of up to one year due to the re-tabling of the Bill’s further reading at the Dewan Rakyat (House of Representatives). Thereafter, at the third stage, the Yang di-Pertuan Agong, who has 30 days to consent. However, the repeal can come to force even without the Agong’s consent once the 30 days lapses, making the repeal inevitable. In the meantime, the PH government can consider declaring a moratorium on the law, convince BN senators to support its repeal or increase the number of PH senators in the Dewan Negara (Senate). 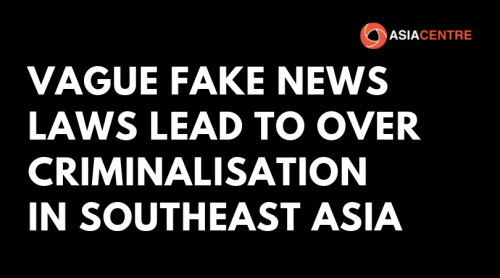 Apart from repealing the Fake News Bill as part of its pre-election promise, the PH government would also have to make its stance clear on Malaysia’s signing onto the ASEAN Declaration of Fake News on 10 May 2018. The Declaration, among other non-legislative measure, seeks to support member states to adopt laws and regulations for their national situation to minimise the harmful effect of fake news. Notwithstanding concerns around the right to make political criticisms and freedom of expression, the primary challenge for Malaysia is how to manage viral disinformation around race related issues that might lead to social unrest. 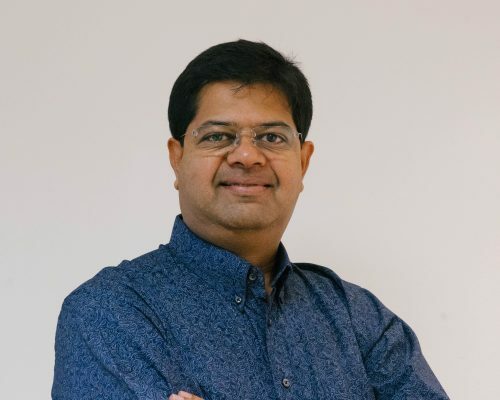 If the current legal tools, scattered across several pieces of legislation are unable to do the job, then solutions need to be considered without comprising the rights of the rights holders. These would also need to include non-legislative tools such as, critical thinking, fact-checking, media literacy, quality of journalism to name a few. 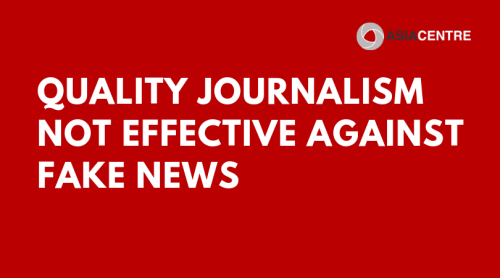 The evolving efforts of technology companies and artificial intelligence to mitigate fake news need also be considered. Without an integrated legal, non-legal and technical intervention, Malaysia’s politics risks falling prey to manufactured disinformation in the country’s post-elections racial posturing. Given, Malaysia’s politically and culturally diverse makeup means updates of speech laws needs to be done in consultation and sensitive to the many stakeholders in society. In this way the quality of debate in Malaysia can be raised.